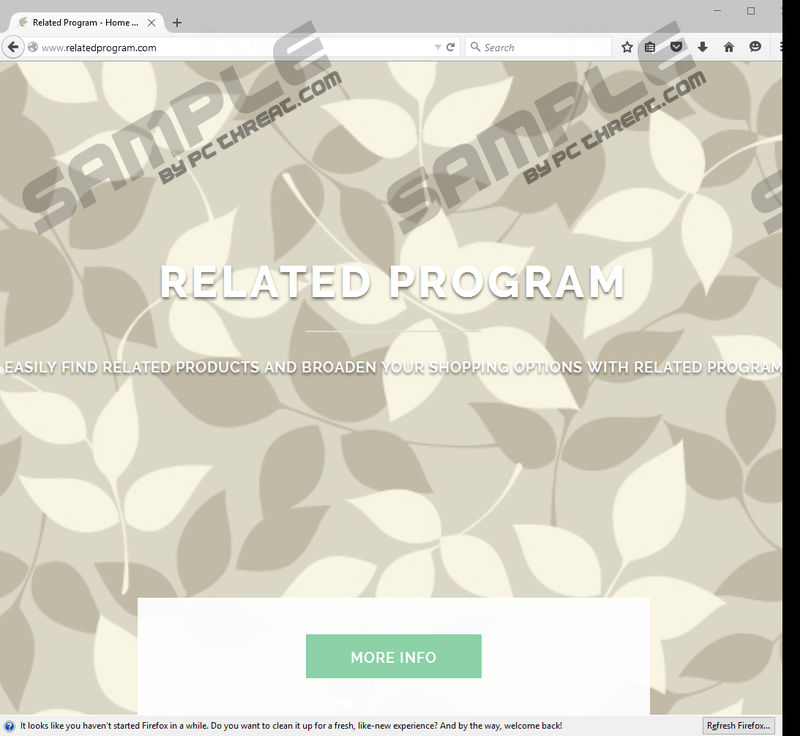 Related Program is a new adware-type application that was configured to display third-party commercial advertisements while you surf the web. We highly recommend that you remove it from your computer because everything about this application points to illegitimate advertising techniques. First of all, its presented ads are annoying, but most importantly, they might be of malicious nature. Due to the unreliability of the ads, it would be best if you got rid of it because this program’s owners are bound to do business with shady entities. This Injekt-engine-based program comes from a well known and infamous developer known as Injekt LLC. This company has been releasing adware for years, and it has created hundreds of malicious applications since its inception. For example, this company is responsible for releasing programs such as Roaming Rate, Dragon Branch, Record Page, and Blazer Deals. Based on our encounters with these older programs, we are convinced that Related Program is more than capable of promoting shady content, but more on that shortly. As far as its origins are concerned, this program’s files were signed by a company called Tech Compliance which we doubt is the same Tech Compliance based in the UK that is nationwide electrical contractor specializing in installation and bespoke inspection. No, we think that it is a fake company name set to mislead users because, as we have mentioned, it is based on the Injekt engine created by Injekt LLC. Even though this program’s distribution methods are unknown because it has come out only recently and it is yet to become popular, we believe that it comes in software bundles. This method for distributing adware is employed by many adware developers, and Injekt LLC is no exception. The software bundles that feature it are probably hosted on freeware websites. So you might be able to remove Related Program from the installation setup by selecting advanced options and unchecking this adware’s checkbox. However, this might not be the case as the bundling methods differ from bundle to bundle because most freeware websites use unique installers. While some useful programs are ad-supported and show advertisements as a means to cover development costs or make a small profit, this particular application, however, it dedicated to displaying ads. Regardless of the wording that is used to describe it, this adware will not improve your browsing experience in any shape or form. 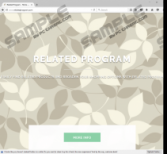 According to the EULA found on this adware’s promotional website at Relatedprogram.com, it has been configured to display ads that come in the form of banners, videos, in-texts, links, interstitial advertising, full pages, and so on. These ads can come in large numbers and may even obstruct the whole browsing experience and prevent you from clicking something by blocking the way. It is less likely but nevertheless possible for it to slow down your web browser’s performance. Note that this adware is compatible with Microsoft Internet Explorer, Mozilla Firefox, and Google Chrome. However, the performance-related issues are not as important as the problems regarding online security. We want to point out the fact that Related Program’s promoted content comes from various sources and all this program does is provides a link to a particular website. However, given the poor track record of Injekt-based software we are concerned that, much like its clones, this particular adware can also promote malicious content. For example, it might advertise downloads of similar adware, browser hijackers, and potentially unwanted programs, such as eTogether, Guntony, Top Media Player, and so on. Apart from promoting downloads of shady and sometimes even malicious software, Related Program can also advertise various questionable websites. Therefore, if you want to keep your computer safe and secure, you ought to delete this adware. The information provided in this short description makes it abundantly clear — Related Program is a malicious application whose only purpose is to make money by showing you annoying and downright unreliable content that can compromise your computer’s security. Testing has shown that you can remove this adware by running its uninstaller from Control Panel. Please check out the instructions below on how you can execute the uninstaller based on the version of your PC’s operating system. Locate the adware and right-click it. Open the Charm bar and Select Settings. Locate the software and click the Uninstall button. Quick & tested solution for Related Program removal.